Yep, here it is, two weeks after my last post and I am in a real quandary. Yes, Christmas was great! We spent the eve with Mer’s brother and his whole family. I think there were 27 of us and only 1 was missing due to being out of the country. The snackers’ buffet dinner was delicious and varied so we had plenty to eat without a massive sit-down meal of gigantic proportions. A much easier solution for a large family gathering than our Thanksgiving dinner which took 4 tables, 3 cooks and two kitchens to pull off for 13 folks. Granted, Thanksgiving was a more “traditional” meal but no one left either one, hungry. But, back to my quandary. I mentioned in my last blog (I still hate that word) that I was going to get “my precious”, a Pantech UML290 Verizon USB Modem. Well, I did… eventually. Sure, I got there and sure the order, placed online on BestBuy.com for store pickup had gone through including the charges. But actually getting this little guy in hand at the store turned out to be a 90 minute hassle of mind numbing proportions. In short, the order, though confirmed and charged, was automatically cancelled at the store when the clerk tried to pick it up because their inventory said they were out.. Never mind that they had 22 of them sitting in the drawer. So I spent the next hour waiting for various authorizations amidst the turmoil of last minute shoppers that had the BestBuy printers in a tailspin trying to make hardcopy contracts for human signature. But, eventually, my patience (and Mer’s) prevailed and I left the store with “my precious” in hand. It was still a half day before I could plug it in and be Wowed…. and I was! Yes, it is everything I had hoped for. 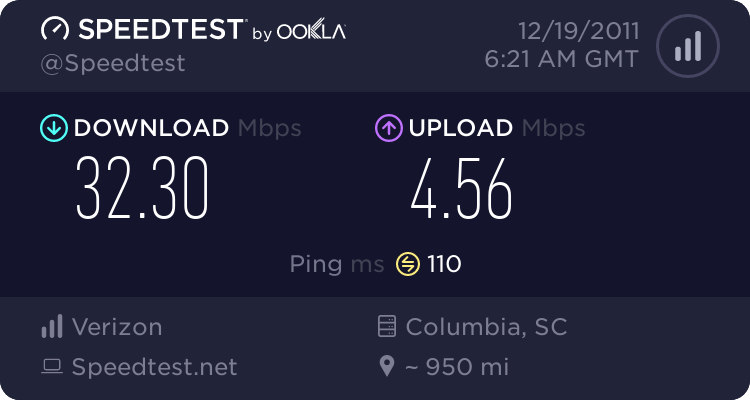 I get up to 31 mbps download and nearly 5mbps upload speeds per Speedtest.net and the dataflow is as good or better than I usually had on my cable internet back in Raleigh. This was the best I have gotten but you can see the trends over time before and after I got the UML290 USB Modem (prior to 12/18/2011) until today. The first spike was while we were on Time Warner in Raleigh for Thanksgiving. Prior to that anything over about 500kbps was all Sprint 4g/3g and the rest was the campground wifi. Just pause your cursor on the graph to see the date/time and speed of any point. Now for the quandary…. This device has only two service plans available for it… A 5 gigabyte for $50 plan and a 10 gigabyte for $80 plan. Each comes with a $10 per gigabyte over limit fee. Ok, you say, I can live with that for such great connectivity. However, it only took 4 days to use up the whole 5 gigabytes of data allowance my contracted plan had. Out of this, only about 400 megabytes was due to streaming video. OK, so I wanted to catch up on a couple of Two and a Half Men episodes I missed. The rest, just disappeared, quickly! No wonder I have been so frustrated with the internet connectivity I have been experiencing “out here”. I am still picking the glass out of my teeth from hitting the connectivity wall and I’m trying to find all the holes in this data bucket. I think the real issue is that I do a lot of different things besides read email and follow a couple of forums and blogs. I do have some online backups setup, too, which I am sure may have taken a few hundred megabytes but that is a once a week hit. I just have a lot of stuff in “the Cloud”. Maybe there is a lot of data syncing going on with that stuff but it’s not like it changes much. The short of it is that I am in love with this Verizon 4g LTE USB Modem and what it delivers in performance, even with no external antennas on it. But I am crushed by the obvious ongoing cost. The $50 per month (plus a 15% federal tax) was ungainly but I was willing to work around that. But estimating my ongoing monthly expense for what looks like 70 to80 gigabytes makes it impossible to sustain. So, I can’t live with it and I can’t live without it and thus, I am heartbroken. I finally found a solution and can’t make use of it because of the costs and it has to go back to BestBuy in the next couple of days. On other fronts, Katie has had another seizure, her second in 26 days, and that worries me, a lot. She is such a sweet individual and just does not deserve this terrible flaw. We are settled in here until about April. Mer’s brother and his family just can’t get a break. His neuropathy has worsened a lot and over the holidays they found out that his oldest daughter has to have a radical double mastectomy, immediately! More prayers are surely needed for them. I hope that we can be here for support for as long as they need but that can not take the sting out of it nor fix any of the problems they are struggling with. So far, all of these devastating health problems would likely have been caught and corrected during the recommended regular age related health screenings. Sure haste makes waste but it is very true that he who hesitates is lost. I know that sometimes, it is very hard to find the middle ground in a daily swamp full of alligators. Please do your due diligence and keep up with your recommended health screenings. The inconvenience and cost is cheap insurance if prevents even one devastating medical problem later on. On this note, let me close by saying the weather has turned chilly, too. Freezes are expected over the next couple of nights but beautiful blue sky days are mixed with the anticipation of seeing Mer’s cousins passing through in a few days. They are special people and we have not seen them in several years. They are on their way from Toronto to south Florida, interim weather permitting and it will be wonderful to see them, again. PS. 1/5/2012 Update: The coldest it got in the campground was only 31 degrees and the cousins are due in this afternoon!